I have finally figured out why Teresa and I are duplicating each other. I realized it’s not a miracle we are thinking the same thing at the same time. I was getting upset by it because we don’t need to duplicate each other. There are millions of patterns and a gazillion ideas. I was asked by a few viewers yesterday and today about doing something through a private email and again yesterday on the Open Wall of Mikeyssmail. It turns out, the viewer posted the same request on both of our Facebooks. Viewers know Teresa and I are busy and will double up on a request. 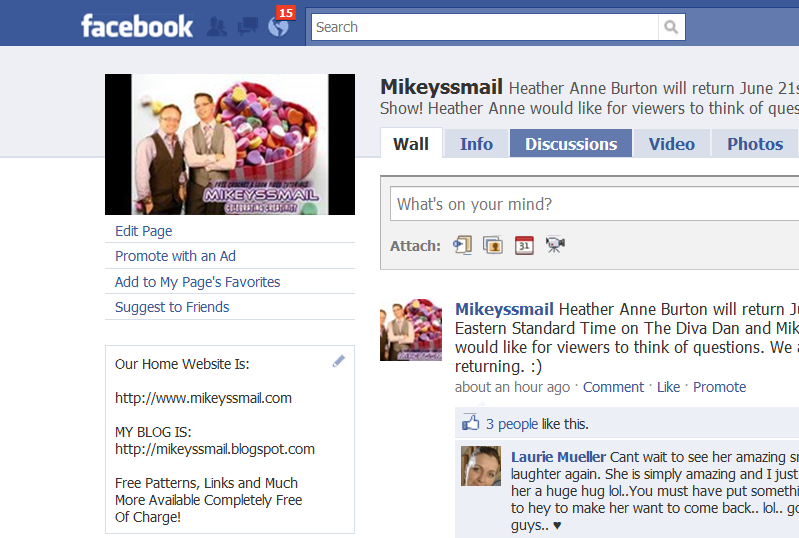 They are double posting stuff on both sites, in YOUTUBE, EMAIL or FACEBOOK FAN PAGE WALL. I responded and so did Teresa with the exact same thing today. I had the video already done and I just gave them the link to the video. However, Teresa has also done the same thing on the same day. It’s not a fluke, it’s because we are both trying to keep up with our fan mail at the same time. Simple requests are quick to film and we are filling in a niche. I get the impatient nature of a viewer who is in the middle of the project that wants a fast answer. I understand because one of us may not have time to respond, however, when we do both have time, it appears we are copying each other then other viewers are writing me telling me to stop copying her and I am getting viewers telling me she is copying me. As far as I see it now, it’s not Teresa or I’s fault of duplication. We are merely responding to the same questions that are being posted on each site. I owe Teresa an apology for being upset as I couldn’t figure out why this was happening. Today, I just seen evidence to why this is happening and it makes complete sense without being her or I at fault. She is not to blame, she is merely doing responding to viewers with what they are asking for, the same viewers who have asked me the same question at the same time. We both want the same thing… we want people to learn and grow. How do we stop this? I’m not sure. We need to be different as having two identical channels don’t work. We are going to have duplication as fundamental stitches are the same. It’s when we are launching the same tutorials and demonstrations at the same time is when it looks like there’s a war going on when there’s not. We are occassionally going to have the same pattern being demonstrated as open source patterns allow that to be possible. This entry was posted in Announcements and tagged Crochet, Email, ideas, Pattern, TheCrochetCrowd, Viewer, Viewers, YouTube. Bookmark the permalink. I found that I did a video on the same stitch as Teresa when I was just starting out (thermal stitch)…She called it by a different name. But it was basically the same thing. I apologized, and she was very gracious and said that it was not a problem. That people learning to crochet often like to watch different teachers teach the same stitch in different ways. (I’m paraphrasing.) Viewers often like to compare and some get very defensive of their favorite teacher. Believe me…Its not the teachers causing the ruckus! I still do not feel like I’m a competitor, we are teachers working in the same school and in the same department. Colleagues! Okay.Did Teresa email you any Questions about this? If not,Then i wouldn’t worry about it.Some people like to start a controversy and that’s is where the trouble revolts.I would continue to do what you do! you are very respectful and you are patient enough to demonstrate step by step instructions in every video tutorial that you make! If it weren’t… See More… See More for you doing this.I wouldn’t learn how to make the baby sweaters,etc.I do think this person saying this about you,Is just being a troll.Just looking to start conspiracy with anything or anyone.If they REALLY would take notice what you REALLY do on here.They would respect the both of you.and not even once start this junk.I think it is unfair to you and Teresa.I do however,Find she is fast on some tutorials.But,That still doesn’t make right of this “Viewer” to say these things.I hope this matter comes to some kind of closure here. I don’t think you need to worry about duplicating. I always think that the more information that is out there, the better it is for me. You and Teresa have different ways of explaining things and sometimes, when I don’t understand what one of you is trying to say, the other one will click. I’m sure other people have the same experience. I am a fan of both of you and yes, I had thought it odd that you seem to come up with the same ideas at the same time, but that doesn’t mean I won’t watch both. You both have unique ideas to offer and unique ways of doing things. Neither of you should feel bad. wow…. some people…. i use both of you guys! you two are the best people to learn from, i use her videos for one thing and yours for other, im not sure why people aremaking such a big deal. most of the patterns can be sold at stores, you guys just help veiwers to make since of them! you guys rock! oh well, i say thanks to BOTH of you. i agree, it is a waste of time tho!